“A DECLASSIFIED REPORT by the US Defense Department reveals that Washington helped Israel develop a hydrogen bomb, in violation of international law. … The report’s release earlier this week was initiated by a Freedom of Information Act request made three years ago by Grant Smith, director of the Washington think tank Institute for Research: Middle Eastern Policy. Smith filed a lawsuit in September in order to compel the Pentagon to substantially address the request. … Israeli Prime Minister Binyamin Netanyahu’s planned address before the US Congress was controversially arranged by Republican leadership without consultation of congressional Democrats or the White House. Commentary by Michael Olanich: If anything, the declassification of this 1987 report by the Department of Defense is only further confirmation to the total subservience of our government to that of Israel. Since its inception in 1948, Israel has been supported militarily, financially, and diplomatically by the U.S., with an estimated $3 billion given to them each year in foreign aid. And, that does not count the additional $10-15 billion sent to Israel in indirect aid via loan guarantees which are never paid back, and valuable military equipment which is deemed “scrapped.” Without this consistent support, Israel would cease to exist as a nation, despite its nuclear and military arsenal. Furthermore, to continue to aid and abet a foreign nation which has deliberately attacked us by trying to sink a U.S. Navy vessel — the U.S.S. Liberty — in 1967, defies all logic and is beyond comprehension. Israel also has a proven track record of spying on the U.S., with the case of American-Jew Jonathan Pollard being the most infamous. The only logical conclusion an objective observer can draw is that our government has somehow been infiltrated or corrupted to a significant extent by America’s 2% Jewish minority, which seeks to serve an agenda that only benefits Jews, and not Americans. This fact is inescapable – and anyone who believes otherwise is either ignorant of the facts or is acting in denial to avoid placing the blame where it squarely belongs. Nevertheless, we should be grateful to Americans like Grant Smith. He has single-handedly forced the hand of the government to release a damning report that provides concrete proof of America’s involvement in building Israel’s weapons of mass destruction – the very premise we’ve used to wage war and conquer nations such as Iraq, based on zero evidence. And, the very reason why we have been acting in an aggressive manner towards Iran for over a decade, placing debilitating sanctions on that nation because they wish to pursue the science of nuclear energy so they can sustain themselves. The duty of every American must be to expose this great hypocrisy. Whenever you hear someone or some media personality explain to you how “Israel is America’s only ally in the Middle East,” or how “Iran threatens America’s security,” speak out and speak loudly to expose these sentiments for the blatant lies they are. 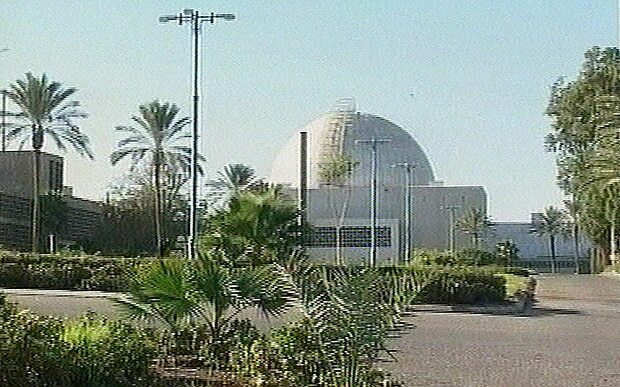 West Germany secretly funded the development of Israel’s nuclear weapons, a German newspaper has claimed, despite Israeli denials. 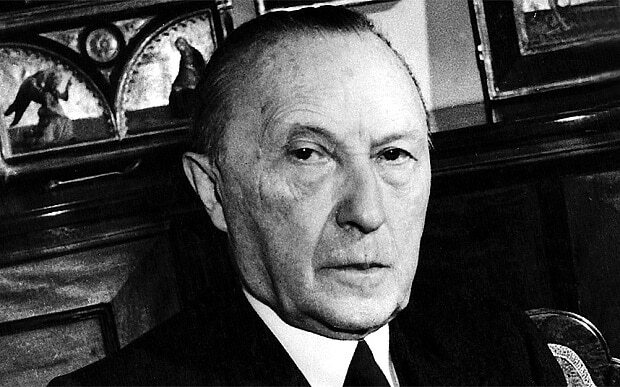 Welt newspaper repeated long-standing allegations that the government of former chancellor Konrad Adenauer secretly channelled hundreds of millions of dollars into Israel’s nuclear programme in the 1960s. The newspaper insisted the claims were true, despite a categorical denial earlier this month from Shimon Peres, the former Israeli president, who was in charge of the nuclear weapons project at the time. In a detailed report, Welt claimed the funds were disguised as a $500 million (£338 million) loan for the development of the Negev desert. The arrangement was agreed at a meeting between Mr Adenauer and David Ben-Gurion, the Israeli prime minister, in New York in 1960, the newspaper claimed. The agreement was informal and was never scrutinised by the West German cabinet or parliament. It was known as “Aktion Geschäftsfreund”, or “Operation Business Associate” by the West German foreign ministry. The funds were channelled to Israel through the Kreditanstalt für Wiederaufbau, a government-owned development bank. The bank has declined to release details of its payments to Israel under the programme. It has long been claimed that West Germany helped pay for Israel’s nuclear weapons programme, but Mr Peres issued a denial earlier this month. The 91-year-old told Spiegel magazine the allegations were the result of a misunderstanding. The suspicions date back to claims by Franz Josef Strauss, a former West German defence minister, about a secret meeting with Mr Ben-Gurion in Paris in 1961. The former Israeli prime minister had “come to talk about nuclear weapons production”, Mr Strauss claimed. Mr Peres, who was also at the meeting, told Spiegel: “Maybe Strauss understood that, but I didn’t hear Ben-Gurion say it”. He told the magazine the West German money was indeed spent on “the development of the Negev desert”. Mr Peres is believed to have been in charge of the Israeli nuclear weapons project. Israel has never officially acknowledged it possesses nuclear weapons. Explicit details and photographs of its weapons project were leaked by Mordechai Vanunu, a former nuclear technician, in 1986. An unexplained fire, disappearing scientists and attacks on prominent Iranian nuclear experts: The Israeli secret service Mossad seems to be waging a shadowy war on Tehran’s nuclear program. Will it be enough to stop Iran’s alleged drive to develop atomic weapons? The young man in the spotlight appeared earnest and friendly, wearing a blue sweater and a freshly ironed shirt, his hair carefully combed. He seemed to want to project an air of credibility. These words opened the most spectacular confession ever shown on Iranian TV. Such self-incriminations, whether uttered by arrested members of the opposition or by foreign journalists, are far from a rare occurrence here. But Jamali’s statements are unique in that this is the first time an Iranian has publically admitted to committing murder in the country’s capital on orders from Iran’s archenemy, Israel. Jamali says he killed nuclear physicist Massoud Ali Mohammadi using a remote-controlled bomb on Jan. 12 last year, following precise planning and intensive training by the Israeli intelligence service Mossad. Some aspects of this confession may be mere propaganda. But it nonetheless indicates that those who may have blackmailed or fabricated Jamali’s statements felt compelled to admit that Iran’s enemies have the capability of setting off bombs right in the heart of the country. The alleged perpetrator’s dubious confession is simultaneously an admission on the part of the regime that a shadowy war over its nuclear program has begun. Strategists at international security policy think tanks are debating with increasing intensity when the time might come that Israel, with or without American help, will launch a military strike against Iran’s suspected nuclear weapon production facilities. But the real question is now a different one: Has political pressure from the international community combined with clandestine activities on the part of Israel and the US managed to delay such a strike? Have Mossad’s attacks damaged the theocracy’s nuclear program to such a degree that it would now be impossible for Iran to build a nuclear bomb earlier than 2015? For Israel, the question of whether Iran possesses nuclear weapons is a matter of existential significance. Such a bomb would constitute a threat to the Jewish state — as well as to Palestinians in the West Bank and the Gaza Strip. One wonders if Israel’s shadow war should be celebrated for reducing the chances of such an Armageddon. Meir Dagan, the much-honored former head of Mossad, retired late last year after eight years in office. Former Prime Minister Ariel Sharon named Dagan Israel’s highest commander in the covert war against Iran’s nuclear ambitions and Dagan concentrated his attention on precisely this mission. The effectiveness of his covert operations can be seen in the accidents and setbacks that have repeatedly stalled Iran’s nuclear program since then. Important scientists have disappeared without a trace, an unexplained fire broke out in a laboratory and an airplane belonging to the nuclear program crashed. In recent months, a computer worm called Stuxnet wreaked havoc on central control systems for the centrifuges at Iran’s uranium enrichment facility in Natanz. The full scope of the damage from the worm is not yet known. Before leaving his post, Dagan spoke privately about his view of the situation. Unlike other Israelis, he doesn’t believe Iran will be able to build a nuclear bomb before 2015 — and it could even be later than that. Dagan’s message is clear — he opposes war with Iran, which he fears could escalate into all-out conflagration consuming the entire Middle East. He recommends continued covert operations instead, with which he implies Mossad could continue to delay Iran’s creation of a bomb indefinitely. Mossad’s attacks on Iranian nuclear scientists right in the center of Tehran has cast a spotlight on Israel’s shadowy war. Majid Jamali’s confession — assuming it isn’t fabricated — is a particular indication that the assassinations were the result of long-term planning and careful preparation. Jamali is said to have received his first instructions at the Israeli consulate in Istanbul. “I talked to men there, who sat behind darkened windows. They questioned me and wanted me to obtain information on certain parts of Tehran for them,” he says. Jamali says he returned to Iran before delivering 30 handwritten pages full of details on his second visit to Turkey. “My contacts were very pleased with my work,” he adds. Then, he says, his real training began. After various meetings in Europe and Thailand, he allegedly received the first installment of his payment for the assassination — $30,000 (€22,500). A further sum of $20,000 was to be paid after the attack. Jamali says he received the crucial parts of his training in Israel, where Israeli agents simulated the Iranian physicist’s house and street in a military camp near the highway between Tel Aviv and Jerusalem. Mossad also provided a Honda 125 motorcycle, a small and easily maneuverable vehicle common in Tehran. The plan was for Jamali to later outfit a motorcycle of the same model with a bomb, to be detonated in front of Mohammadi’s house. According to his confession, Jamali also received shooting lessons and a makeup artist taught him how to disguise himself with clothes and makeup. In the last phase of training, they did three run-throughs of his mission. Back in Tehran, he says, other Mossad collaborators provided the necessary equipment. The motorcycle was standing ready, as was the bomb, and he received gloves and motorcycle clothing in two cardboard boxes. His equipment also included two satellite phones — on one of those phones he received orders on the early morning of Jan. 12 to carry out the attack. Jamali placed the motorcycle, outfitted with the bomb, on the driver’s side of the physicist’s driveway and detonated it as Mohammadi left his home that morning. The force of the blast was so powerful that it caused heavy flagstones to fall from the front of a four-story apartment building across the way and all the windows to burst. Mohammadi’s car was completely destroyed and he died instantly. Dagan’s secret assistants in Tehran appear to have carried out an operation that was similarly logistically intricate late last year, with a simultaneous double attack on two nuclear scientists, Majid Shahriari and Fereydoon Abbasi Davani. Like Mohammadi, both men belonged to Iran’s nuclear research elite. Officially, Shahriari worked as a professor of nuclear physics at Shahid Beheshti University in Tehran. His specialty was neutron transport, a process that plays a central role in chain reactions within reactors, but also in the construction of nuclear bombs. Abbasi taught in the same department and was one of the country’s very few experts on isotope separation. On November 29, Shahriari and Abbasi were both making their way to the university, as they did nearly every day. Shortly after 8 a.m., Shahriari was in his Peugeot sedan together with his wife, battling his way through the usual traffic on the Artesh Highway in the northern part of the city. He didn’t pay particular attention when a motorcycle drove up close to the driver’s side of his car — such chaos is simply part of life on Tehran’s overcrowded streets. By the time the motorcyclist attached something to Shahriari’s door and sped away, it was too late. The bomb, affixed to the car with a magnet, exploded a few seconds later. Shahriari died instantly, but his wife survived the attack. His colleague Abbasi was more attentive and reacted more quickly, which saved his life. The professor, also traveling with his wife, had just driven away from his home when he noticed a motorcyclist squeeze in close to his vehicle and stick something to the driver’s side door. Abbasi, a long-time member of the Revolutionary Guards, braked immediately and launched himself out of the car, dragging his wife from the passenger seat and taking cover with her on the roadside, just fractions of a second before the device exploded. Targeted killings outside of its borders have been used as a military weapon more often by Israel than by any other country. In its 63 years of existence, Israel has acquired a high degree of craftsmanship when it comes to snuffing out its opponents, and was the first country to develop the technology for targeted killings from the air. In 1978 Israeli agents used poisoned toothpaste to kill Wadih Haddad, the leader of a faction of the Popular Front for the Liberation of Palestine (PFLP). Seven years later they packed a copy of the Koran with explosives and sent it to Ali-Akbar Mohtashamipur, Iran’s ambassador to Syria. In 1997 they attempted, but ultimately failed, to assassinate Hamas leader Khaled Mashal with the neurotoxin botulin in the Jordanian capital, Amman. And exactly a year ago, they appeared unconcerned that surveillance cameras captured each stage of their murder of Hamas activist Mahmoud al-Mabhouh — allowing the world to examine the anatomy of that Dubai attack. Underground militias plotting to undermine the British Mandate in Palestine were using targeted assassination even before the 1948 foundation of the state of Israel, often enough against each another. The Lehi organization, also known as the Stern Gang, was led by Yitzhak Shamir, who drew his inspiration from revolutionary communist movements and the Irish Republican Army (IRA). Russian-born Shamir thought nothing of killing dozens of Jews whom he suspected of collaborating with the British. He was also involved in the murders of a leading British minister and Folke Bernadotte, a Swedish UN diplomat. Shamir, who was Israeli prime minister in the late 1980s and early 90s, is one of a host of leading Israeli politicians and civil servants who were personally involved in targeted killings on behalf of their country before they moved into politics. They include, among others, Defense Minister Ehud Barak — also a former Israeli prime minister — and Deputy Prime Minister Moshe Ya’alon. David Ben-Gurion, Israel’s first prime minister, always rejected assassination because he considered it a breach of the rules of war. Nevertheless he ordered his country’s first targeted killing, the 1956 assassination of Mustafa Hafi, the head of the Egyptian secret service, in the Gaza Strip. Five years later the men who took part in this killing were called upon again to carry out Operation “Sword of Damocles” together with veterans of the Stern Gang, who now worked for Mossad. The aim of the mission was to murder or intimidate German scientists who had worked at the Nazis’ rocket facility in Peenemünde during World War II, and were now helping Egypt develop its own arsenal of missiles. The operation was doomed, however, after a series of mishaps. Two Mossad agents, for instance, were arrested and taken to court in Switzerland for threatening the daughter of one scientist. Their arrest sparked outrage around the world and led to a diplomatic solution to the crisis: The German government offered the scientists new jobs if they agreed to cease working in Egypt and return home. In the 1960s and 1970s rules were laid out under which the Israeli government could order such killings. The targets of such assassination squads fell into three categories: They were either terrorists, the political or military leaders of Israel’s enemies, or people who manufactured weapons of mass destruction or made them available to the country’s foes. The most infamous of these Mossad-led killing sprees was the ruthless hunt for the people behind the massacre of Israeli athletes at the 1972 Olympic Games in Munich. The operation was more than a little revenge-driven, and proved the exception to the rule that killings should primarily serve to defend the state of Israel and its people. After a botched attempt by German authorities to free the hostages at Munich Airport, which led to the killing of all the abducted Israeli athletes, then-Israeli Prime Minister Golda Meir swore that none of those responsible would escape Israel’s wrath. Mossad then drew up a hit-list that included prominent members of the PLO and of the Black September terrorist organization — which carried out the attack — living in Europe. The last man on this list, a PLO official called Atef Bseiso, was shot dead in Paris in 1992, two decades after the tragedy in Munich and only a year before the signing of the Oslo Peace Accord between Israel and the Palestinians. Ali Hassan Salameh, the suspected mastermind of the massacre, was assassinated in Beirut in a Mossad operation in 1979. Six years earlier, a waiter called Ahmed Bouchiki had been shot dead in the Norwegian town of Lillehammer after he was falsely identified as Salameh. Five Mossad agents were arrested and sent to prison for Bouchiki’s murder. PLO leader Yasser Arafat survived at least 10 Mossad attempts on his life, and countless others were called off at the last minute for various reasons. Iraqi President Saddam Hussein, who fired Scud missiles at Israel during the Gulf War of 1991, was another political leader on Mossad’s hit-list. His planned assassination in 1992 was aborted at the last minute after five Israeli soldiers died during a dry run of the operation. One murder that changed the course of Middle Eastern history was the assassination of Sheikh Abbas al-Mussawi, the secretary-general of the Lebanese Hezbollah movement. Al-Mussawi was killed in a helicopter attack on his motorcade in February 1992. The original plan had been simply to abduct him to use as a bargaining chip for the release of Israeli prisoners. But Ehud Barak, Israeli chief of staff at the time, forced through a last-minute change, convincing Prime Minister Shamir to order the cleric’s assassination instead. It seems clear that nobody gave serious thought to the possible consequences of such a flagrant act. Although the operation was a tactical success, it proved a strategic catastrophe — and the reaction was not long in coming. A month after al-Mussawi’s murder, a bomb exploded at the Israeli embassy in the Argentine capital, Buenos Aires, killing 29 Israelis as well as local staff. Furthermore, al-Mussawi was replaced as Hezbollah leader by Hassan Nasrallah, who subsequently built the organization into a powerful and well-armed fighting force that controls southern Lebanon and has the power to hold all of northern Israel in check, as it demonstrated in the second Lebanon conflict of 2006. Today, Nasrallah is the decisive figure in his nation’s political landscape. Only last week, the resignation of his Hezbollah ministers from the Lebanese cabinet plunged the entire country into disarray. Worse still from Tel Aviv’s point of view, the people it assassinated could have become successful negotiators in future peace talks. Take Arafat’s erstwhile deputy, Khalil al-Wazer, better known by his nom-de-guerre, Abu Jihad. Many Israelis still think his execution in 1988 was a tragic mistake. Had Abu Jihad remained alive, he may well have been a more charismatic leader than Arafat or Mahmoud Abbas, the current Palestinian Authority president, and perhaps been in a position to end the simmering conflict between Israel and the Palestinians. Regardless of whether or not such executions are morally justifiable, Mossad murders have had unintended consequences. There’s no better evidence for this than the chain of events which began with the attempt to kill deputy Hamas leader Khalid Mashal in the Jordanian capital in 1997. Mossad agents attacked Mashal in Amman with a neurotoxin, but were caught red-handed by the Jordanian police. As part of the agreement for the return of its agents, Israel had to both provide the Jordanian authorities with the antidote for the poison and release Hamas leader Sheikh Ahmed Yassin from prison. Shortly after his liberation, Sheikh Yassin toured Arab countries collecting donations that he used to launch a wave of murderous assaults on Israel beginning in 2000 and continuing until he was killed by an Israeli helicopter gunship attack in 2004. In the meantime, the failed attempt on Mashal gave him so much prestige that he took over the leadership of Hamas in exile soon after Yassin’s death, and was able to forge closer ties to Shiite Iran than the fundamentalist Sunni Yassin would have ever permitted. When Mossad targeted scientists who helped Israel’s enemies make weapons of mass destruction, the operations were often justified in public as countering an existential threat to Israel and its citizens. This line of reasoning often centered on the Holocaust and the persecution of Europe’s Jews. When Israel found itself under the greatest threat, Ben-Gurion is said to have told staff that his greatest fear was that he may have brought the survivors of the European Jewry to Israel only to have them suffer a second Holocaust. Whenever the threat to the very existence of Israel is debated, there is always someone who equates Israel’s enemies with Hitler. In the 1950s and 1960s Egyptian President Gamal Abdel Nasser was the bogeyman. In the 1970s it was Arafat. In the 1990s it was Saddam Hussein, and today it is Iranian President Mahmoud Ahmedinejad. Israel’s leaders have always worried about the possible physical annihilation of their country, and it is this perceived threat that has formed their justification for the policy of assassination, even though it constitutes a breach of international law and the sovereignty of other nations. Dagan, whom Prime Minister Ariel Sharon once said was particularly skilled at separating Arabs from their heads, has always been surprisingly moderate in his attitude toward military action by the Israeli army. He firmly believes that war should be a weapon of last resort. Dagan only recently spoke out against attacking Iran — in contrast to the more hawkish Prime Minister Benjamin Netanyahu and Defense Minister Barak. Although Dagan thinks Iran poses a threat to Israel’s existence and that the Iranian regime would use nuclear weapons against Israel should it ever obtain them, he is convinced that concerted action can, at the very least, lead to a significant delay in Iran’s nuclear program, if not a scrapping of the project altogether. This would require a combination of international diplomatic pressure, tough economic sanctions, the prevention of the sale of nuclear technology and hardware, support for non-Shiite opposition forces in Iran — and, last but not least, secret Mossad operations. It’s still anyone’s guess whether Prime Minister Netanyahu will be swayed by the optimistic assessment of his former intelligence chief that there’s still plenty of time to continue mounting secret operations against Tehran. And it could well be that Netanyahu still prefers a far more dangerous solution to the Iranian problem.